Blackwater Rollers had a fabulous time bouting the lovely NRV Bruisin’ Burgs for March Attacks this past weekend! We were so pleased to see so many familiar faces, new fans, and even some of our retired Blackwater friends in the audience like Prudence, Zombi, Naughty Nini, Meryl Shreik, and Parabellum! Special thanks to Star City Rollergirls’ Sophie Nominal, Ms. B. Haven, DeviousDee and All Up Anya for their help battling it out on the track. We were particularly pleased to welcome Hell-ga back from retirement for this bout. Although we ultimately were not able to make a comeback in the second half, anyone who was there was able to witness some phenomenal power jams by both teams, including a record 41 points by Pizazz! A lot of folks may have been wondering at the stopped skaters on the track – this is a newer strategy brought on by the updated WFTDA ruleset that has harsher penalties for destruction of the pack. 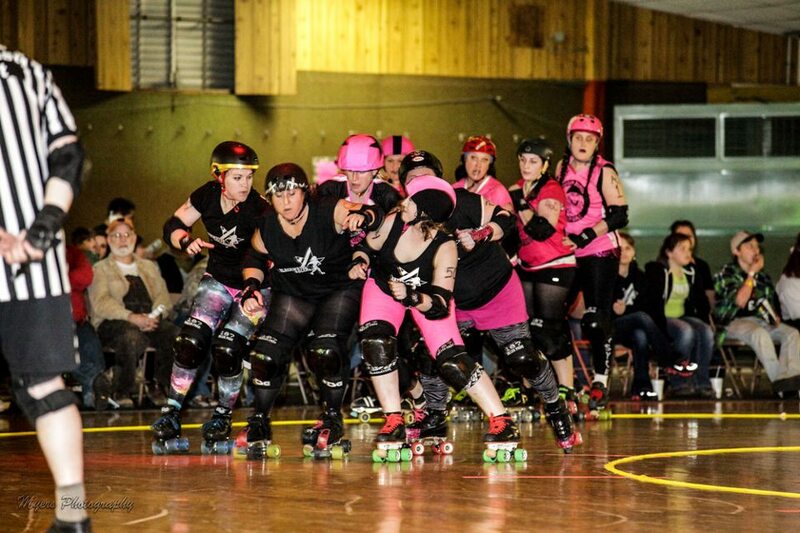 This is because if both teams are more than 10 feet apart, there is “no pack” and the skaters may not engage opposing skaters including the other jammer. Therefore, if one team stands in place so their jammer can run round and round to score for a power jam, the other team can’t chase her more than 10 (or 20 feet ifthe team “bridges” with a single skater) without being called on a destruction of pack penalty. Additionally, you may have noticed skaters hitting each other out and skating backwards – this is because if you are knocked out by a skater who stays in bounds and upright herself, you have to come in behind her. If you don’t, a cutting track penalty is given. Thank goodness we had NRV’s own Slingin’ Gritz announcing to help explain all these technicalities! By the end, the score showed 347 – 206 in favor of NRV. However, a good time was had by all, and it can be argued that Blackwater won the afterparty at El Cazador’s! Please join us for some Co-Ed action in less than two weeks, for Skating with the Stars, April 6th! Although the final rosters are not in, you will definitely be seeing some of Blackwater’s referees in on the game….as well as such derby legends as Groper Cleavage, Art Vandelay, Slingin’ Gritz, Highwayman, and maybe even Luv At First Fright and our hometown hero, Mighty Mouse! A portion of the proceeds will benefit Lynchburg Grows, so be sure to get your pre-sale tickets early from AJ Skateworld to reserve your seat and help a great cause! We’ll see you on the track!